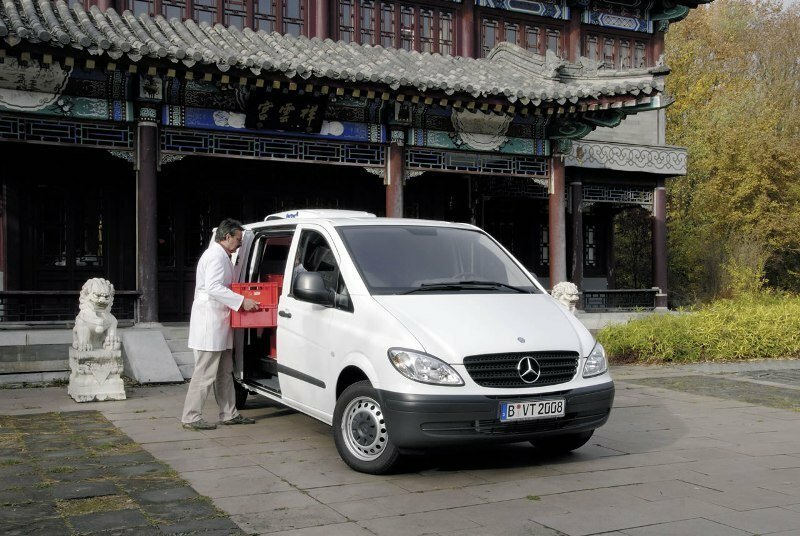 There aren’t many light commercial vehicles available on the market that are able to stack up with success against the Mercedes Vito. The vehicle is one of the best built models in its segment and is equipped with a range of efficient Euro 5 engines which offer payload capacities between 850 kg -1.125 kg. The Mercedes Vito is also pretty versatile too and comes with numerous body options including van, crew van, temperature controlled and minibus versions. Moreover, there are also available three body lengths including compact, long and extra-long models with standard or high roof configurations. 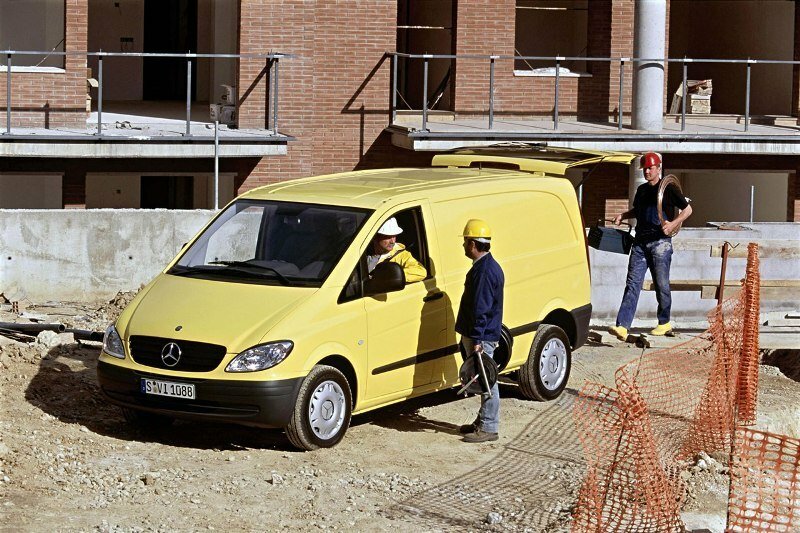 The Vito has a fluid and modern design language and a strong and refined build quality. The boxy shape is slightly masked by a tasty aerodynamic design combined with a raked bonnet and a sloped windshield. At the front, the famous three pointed star stays proud in the center of the black grille which is traversed by two horizontal stripes. The hood received two nice creases which enhance the dynamic look of the vehicle. We also like the sharp headlights fitted with bi-xenon headlamps with integrated cornering light function, fog lamps and LED daytime driving lights. The black bumper continues the aerodynamic design of the body and is fitted with a big air intake which constantly sends fresh air to the engine. Along the sides there is a tasty crease which starts to flow from the front fenders all the way back to the rear vertical light clusters, enhancing the dynamic appearance of the Mercedes Vito. Inside, the dynamic look of the exterior carries over to good effect, with a right-sized dash, center console and steering wheel. Distinctively European in execution, the overall aura of the cabin is well-polished and appealing. The interior design is by far the best found in the segment. 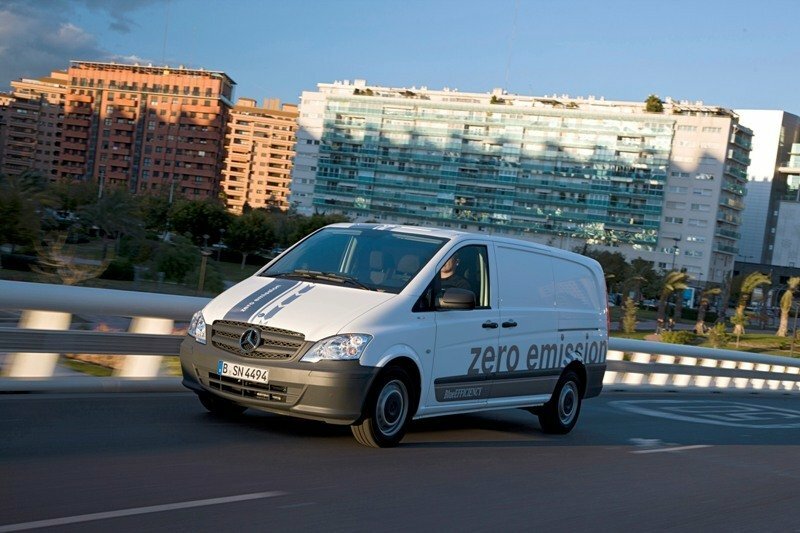 It’s clean and made up of pretty good materials which set new standards in the LCV segment. Passengers are greeted with acres of space, tasty small details and a refreshing airy feel. The center console is large and there’s storage for everyone. Judging by van standards, fit and finish is close to excellent, while cabin lighting is great too. Needless to say that most of controls are laid out in an intuitive manner and Mercedes’s experience with the passenger cars is evident in every detail found inside. The audio system is simple to operate by means of the numerical keypad running along the right side, while the dual-zone climate controls are also nicely finished. In short, everything is exactly where you’d expect, including the dash-mounted gear knob and the steering mounted controls. Though, there is one fault that could give you a few headaches until you’ll learn how to leave with it - the parking brake is foot operated and it’s a bit more difficult to use than a conventional handbrake lever. There are also a bunch of high tech goodies that can’t be found at many LCVs in the business. For instance, the center dash can be equipped with an optional audio telematics system with Media Interface including iPod, USB and Aux cable. Moreover, on the options list you can also find the Linguatronic voice-operated control system. The seats are a bit hard, but they won’t leave you with any back pains even after a longer journey. You’re also treated with a host of useful adjustments, while the steering wheel’s position can be set according to your wishes. Situated in the firm seats peering through the generous windshield, it’s a real pleasure as you have a great road visibility which is combined with a high driving position making the experience even better. Power comes from a 2.1-litre diesel available with 95hp, 136hp and 163hp with 250Nm, 310Nm and 360Nm of torque respectively. For those looking a stronger version Mercedes also offers a 3.0 liter V6 unit which develops a maximum power of 224 hp at 3800 rpm. 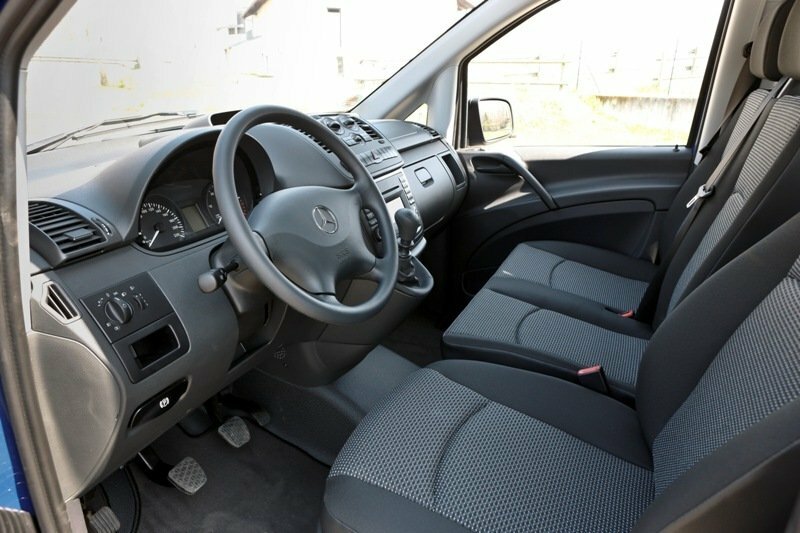 The Mercedes Vito is available in both 4x2 and 4x4 versions, with six speed manual and five speed automatic transmissions. All four diesel engines meet the requirements of the Euro 5 emissions standard and are among the most efficient units in their class. The 3.0 unit is a real gem. As you fire the engine, the V6 gets started to life and falls into a smooth drone in the background. With just over 3,000 kg to motivate, the 224 horsepower and the 440 Nm of torque are up to the job, regardless of what weight you’ll add at the back. The first stab of the throttle will reward you with more acceleration than expected. Keep your foot planted on the go pedal and you’ll be able to hit a top speed of up to 212 km/h. The five-speed automatic flicks through the ratios with the fast response expected from the German manufacturer, reinforcing the rumor that Mercedes offers some of the best transmissions in the business. On the road, the Mercedes Vito has a pretty well balanced and comfortable ride thanks to a capable suspension with front McPherson struts and an independent rear setup. The latest Mercedes Vito received new front suspension towers, springs, shock absorbers and stabilizer bar, while the rear suspension arms control new springs and dampers. Even is the ride is well balanced, corners are a bit of a problem as the tall stance of the van will cut your enthusiasm pretty fast. Moreover, the steering is a bit light and lacks any significant road feedback. But we aren’t talking about sports cars here hence we won’t complain too much about it as it will be hard to find better performances in this class. However, you’ll certainly like the generous grip offered by the standard tires especially if you’ll opt for the all wheel drive version. 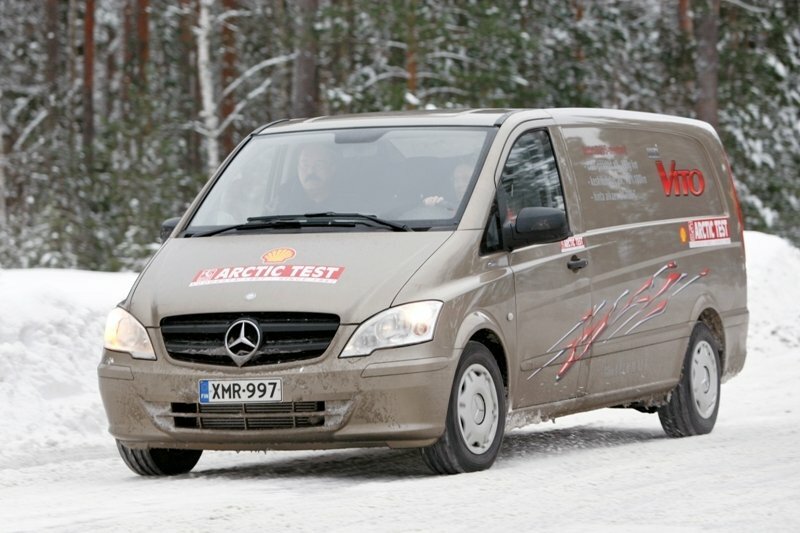 Mercedes always paid maximum attention to the safety department and the Vito makes no exception, as it gets standard Electronic Stability Programme (ESP) along with ABS, Brake Assist, Electronic Brakeforce Distribution and traction control. In the realm of light commercial vehicle, you’re basking in a big bucket of choice. But while the Renault Trafic might be more practical, it’s decidedly less refined. And while the Fiat Scudo might be more affordable, it lacks the strong build quality found at the Vito. While there’s no lack of awesomeness to the Mercedes Vito’s package, we simply can’t fathom the idea of giving so much money on a commercial vehicle. It’s true that it has anything it need to be basically the best model in its class, but with a starting price of $28830 that can go up to $56360, this Merc is a bit costly. On the other hand it’s reliable to the core and most importantly efficient. And these aspects alone could turn the balance in its favor regardless of the price tag.